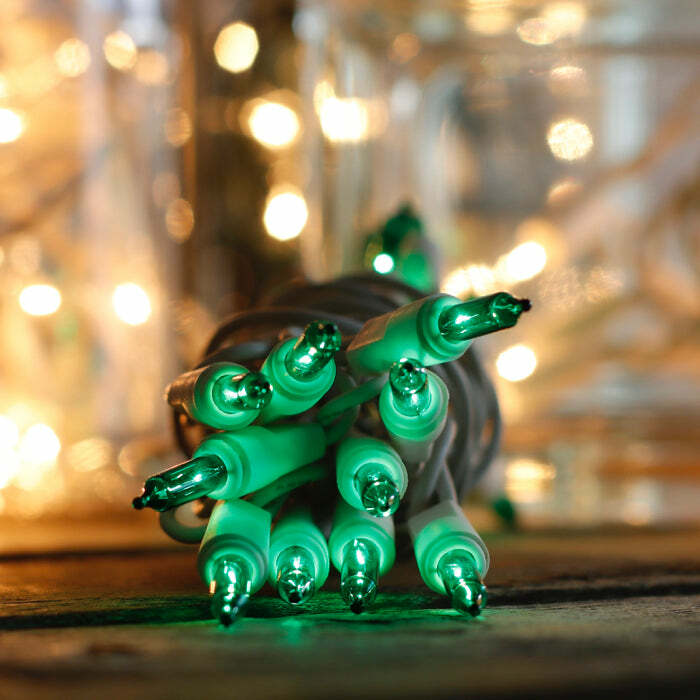 These striking green craft lights are a must have for crafters and decorators alike! Each string comes with 10 lenses, spaced 3 inches apart. With just over 2 feet of lit length, the amount of light might surprise you. Crafters enjoy the 36-inch lead line, as it means they usually don't need to add an extension cord to plug in their projects. A quick and easy idea for Christmas: Fill glass blocks with these lights. Wrap the blocks with red and green wired Christmas ribbon. Plug in and place under your tree for glowing decorations until you get all the Christmas shopping done. What can I do with one string of craft lights? Lights are better than expected and arrived very quickly. Very happy with my purchase. They are a replacement set to put into a bottle as a night light. Happy to know Ihave found inexpensive replacements. How many plugs does this light string have? Just one male plug. The end of the light string is just a light bulb! What is a 36-inch lead wire? There are 36 inches of plain wire between the plug and first bulb. Can I use these light strings outside? Sure, these lights are rated for indoor or outdoor use. Just keep in mind that sun, wind and exposure to the elements will take a toll on your lights. Can I run these lights in series? Nope, they just have the one plug so they aren't a great solution if you need to connect multiple sets together. If you need to do that, you'll need a female plug at the end of the string. We have a ton of Christmas tree lights with two plugs to choose from. Do you sell replacement bulbs for these lights strings? No, we don't but each string comes with a couple of replacement bulbs. If one bulb goes out will the others? If a bulb burns out then the others in the string will remain lit. Since the same amount of current is now flowing through fewer bulbs, replace that bulb right away with one of the replacement bulbs. Do these light strings work on batteries? Do they have a switch? No to both questions. These are strictly for plugging into the wall and they don't have an inline switch. See our battery lights if that's what you're looking for. Do these lights flash on and off?